I put together a description of a tactile Easter egg hunt over in the Cuddle Party. 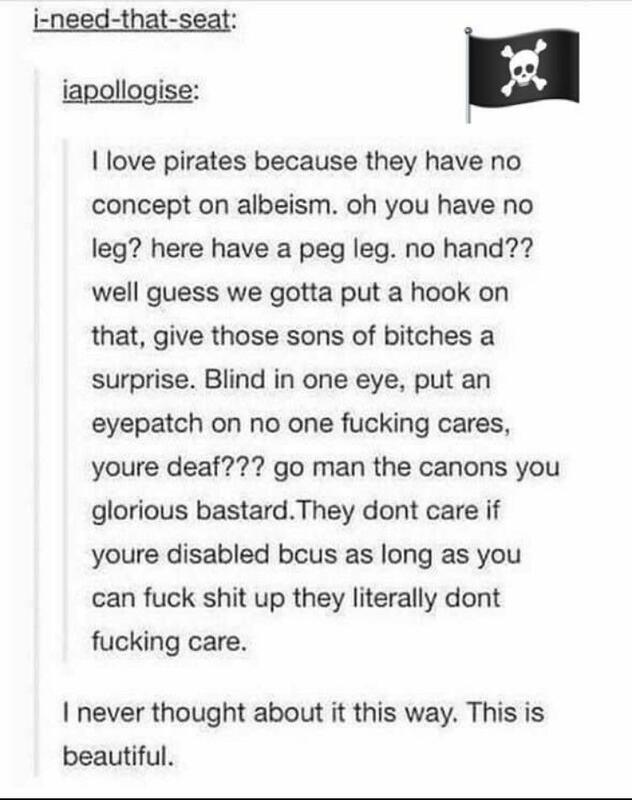 Pirates are indifferent to disability. <3 This is historically documentable. They had a high rate of injury, but they were tough bastards, and in some cases innovators in the field of prosthetics. In fact, a split hook is still among the most popular upper-body prosthetics. New Crowdfunding Project: "Asexual Fairy Tales"
Now funding on Kickstarter: an anthology of asexual fairy tales with illustrations. :D 3q3q3q!!! I definitely want the hardcopy. I am considering whether I want to bump up to the next level and also get two signed prints of the artwork. If you want there to be more acefic in the world, go check out this project. Fairytales are for everyone! And the author is right, some of those things were already ace as hell, it doesn't take much to highlight that. Well, sort of. Ketamine works for treating resistant depression in some people, but both the side effects and the stigma cause significant problems. This really makes me want to get into Terramagne and write about a character with depression and horse traits. Because ketamine's main use is, in fact, for large animals. It's safer for them than a lot of other drugs -- particularly for skittish prey animals who are otherwise prone to spook and bash themselves into walls or trample nearby humans. So it stands to reason that while antidepressants might work much less well on equine-human persons, ketamine might work quite a lot better. That doesn't necessarily mean it has no side effects, but it's probably a reliable way of damping down the depression. One of many ways in which soups, especially primal soups, can have very different reactions to stuff than ordinary humans do. And yet, truth told, it works well enough for humans that some stick with it like glue -- especially people for whom the usual stuff does not work. So then, an equine primal, and their human friends who also use ketamine, and their support group, because T-America doesn't bury this stuff under the rug near as much as here. Or we could always go with Moon Door instead. You know some of the Women's Chronic Pain Support Group must have tried it, some of them are try-anything types. My money's on Soma.